When it rains, some outdoor events and activities, like baseball games, open-air concerts or barbecues, are cancelled or postponed. They are “rained out” or “rained off”. There are other events, however, that won’t be cancelled even when it rains. They are “rain or shine” events. For example, you’re invited to an outdoor yoga class. The invitation says, “All ages and levels are welcomed. Come rain or shine.” It means anyone can join and it’ll be held whether it rains or the sun shines. The phrase is also used figuratively for “no matter what happens”. For example, I’ll be there, come rain or shine. 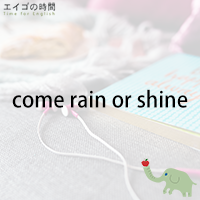 You can also say “come rain or come shine”, or just “rain or shine” without the word “come”. For example, he’s always reliable, rain or shine. I’ll be there, rain or shine.